Dr. Nick Dodman is a Professor, as well as Section Head and Program Director for the Animal Behavior Department of Clinical Sciences at the Cummings School of Veterinary Medicine at Tufts University. He graduated from the Glasgow University Veterinary School in Scotland, and he served as a surgical intern there before joining their faculty. Nick also later received a Diploma in Veterinary Anesthesia from the Royal College of Veterinary Surgeons. Afterward, Nick joined the faculty at Tufts where he is today. Nick has received many honors and awards in his career. He is a member of the American Veterinary Medical Association, leadership council member of the humane society veterinary medical association, scientific advisor to the center for canine behavior studies, scientific advisor to DogTV, diplomate of the American College of Veterinary Behaviorists, a diplomate of the American College of Veterinary Anesthesiologists, and one of the founder member of “Vets for Equine Welfare”. Nick has also authored four bestselling books and has been featured widely in the media including appearances on Oprah, The Today Show, Good Morning America, The Discovery Chanel, NOVA, Animal Planet, BBC, and NPR. Nick is here with us today to tell us all about his journey through life and science. Nick likes to spend his free time outside enjoying nature, playing golf, and walking his dogs. He also likes to travel to different places to visit family. 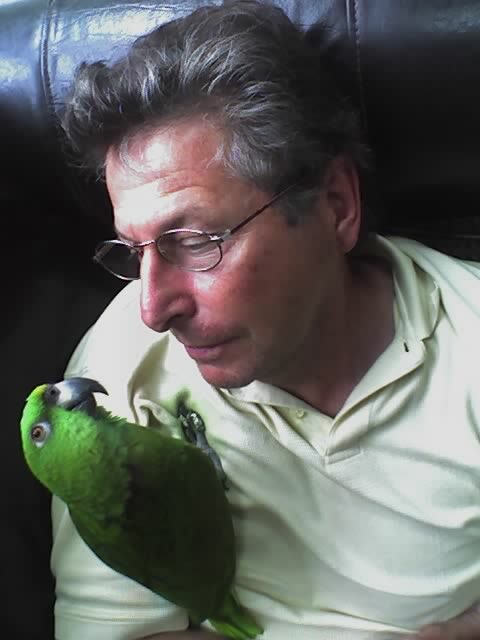 He specializes in understanding and treating animal behavior issues. Nick’s job includes teaching, research, and clinical practice. There were always animals around when Nick was growing up. He remembers rehabilitating a young Speckled Thrush that had fallen out of its nest and injured its wings. They had to feed it every two hours initially and took care of it until it was strong enough to be released. When it was time, they opened up the doors, and it flew away. There was one day the next thing where the bird came back and flew into their home seemingly to say hello. These early experiences really cultivated his empathy and care for animals, and when it was time in school to choose a career path, he chose to be a veterinarian. His group has been studying compulsive disorders/autism in Bull Terriers. They had some markers in the blood to suggest this was more similar to autism than a simple compulsive disorder. They collected DNA samples from affected animals and controls and sent them to the NIH and an independent company for analysis. There were significant findings, but these results were not sustained with genetic sequencing studies. This was really frustrating and they had to re-evaluate their methods to address certain issues. It was very exciting when Nick’s team discovered the gene responsible for obsessive-compulsive disorders in Dobermans. They met with people at the NIH to discuss this finding and were pleased that their results prompted the redirection of resources to identifying this gene in people. Japan is Nick’s favorite travel destination because it is so culturally different from what he is used to. He is delighted by Japanese food, the people, and the culture. Though he has had a few unexpected experience with unusual foods, Nick also enjoys most Japanese cuisine and even has a favorite sushi bar in Tokyo. Nick used to do a fair amount of large animal work, and it was necessary to anesthetize them to perform certain procedures. He describes how a misplaced anesthesia catheter by a member on the medical team led to mayhem when the large bull they were working on suddenly awoke and became very agitated. Do what you love. Find what you like to do and stick with it. Dr. Dodman is internationally recognized and sought after as a leader in his field. He has had published five trade books, two textbooks and more than 100 scientific articles and contributions to scientific books and journals. He also holds 10 US Patents for various inventions related to the control of animal behavior. He lives near Tufts University with his wife, Dr. Linda Breitman, a veterinarian who specializes in small animals, and their children. Since the mid 1990s, Dr. Dodman has written four acclaimed bestselling books that have received a tremendous amount of national press. These books are entitled The Dog Who Loved Too Much, The Cat Who Cried for Help, Dogs Behaving Badly, and If Only They Could Speak. His most recent book, The Well-Adjusted Dog, is a how-to-do bible for dog owners. Dr. Dodman is also editor of – and contributor to – two popular press puppy books, Puppy’s First Steps and Good Old Dog.